As I mentioned in my last post, there were these two other pictures that I only saw for the very first time. Below is one with a grandfather that I never met. 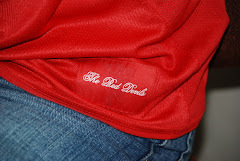 He was my mother's father. He was more known as Mandur Apong and lived in Kampung Pekan Lama of Kampung Ayer. My father could not recall who the three boys are. Here is another picture that I never saw before. It was taken at the Old Airport when one of my father's cousins was leaving Brunei to study overseas. 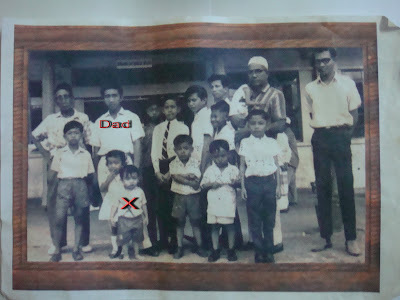 In the picture was our eldest brother, who died when he fell and drowned in Kampung Ayer (marked X in the picture). The girl behind him was my eldest sister. 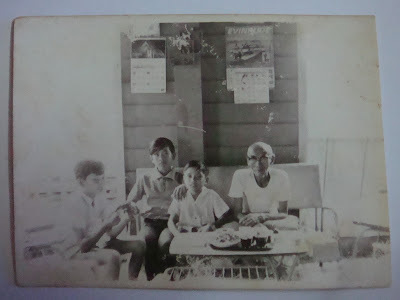 The man in the 'topi haji' (or white skullhat) is my father's uncle, who is one of the Pengiran Cheterias.